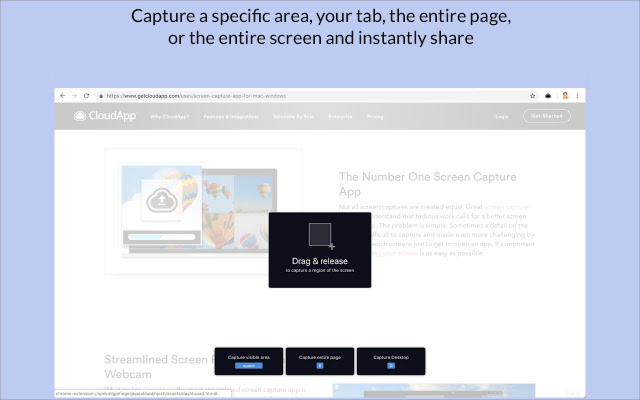 CloudApp for Chrome is an easy-to-use, free screen capture extension that combines screen recording and screenshot annotation into one app. Capture, share, and accelerate your communication. To get started, you could watch the gif to the right telling you about the basic features of CloudApp for Chrome. There are also several other videos below. To get started, click the black cloud icon on the top right of your browser window to login or create an account. After logging in, select the 'Capture' for screenshot options or the 'Record' for recording options. If you'd prefer a more full-featured tool, we also support more powerful Mac and Windows desktop apps. If you have questions or need help, please get in touch! Instantly capture what you see to your personal cloud and share it with others. Capture options include full page, partial page selection and what's visible on the page. Enhance screenshots and GIFs with annotations. Add quick drawings, arrows, lines, emojis and other shapes to communicate with clarity. Blur any sensitive information. Instantly share what's happening on your screen by recording a video. A link is automatically copied to your clipboard to paste anywhere. 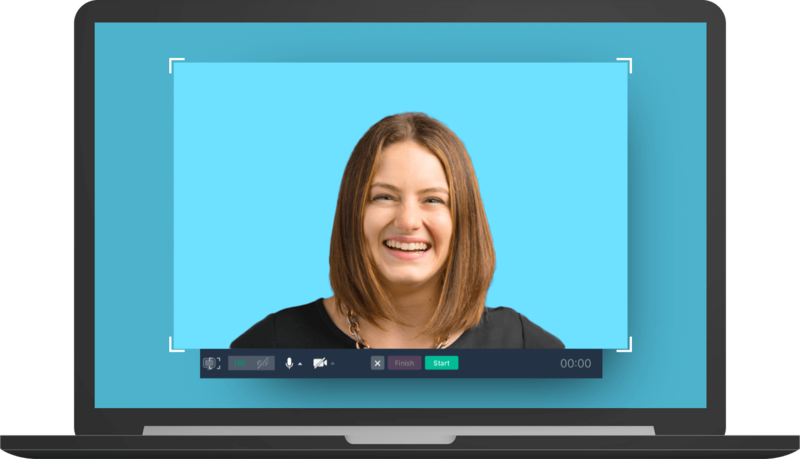 Create a video with your webcam to make any communication more personal. Stand out with a thoughtful and customized message. 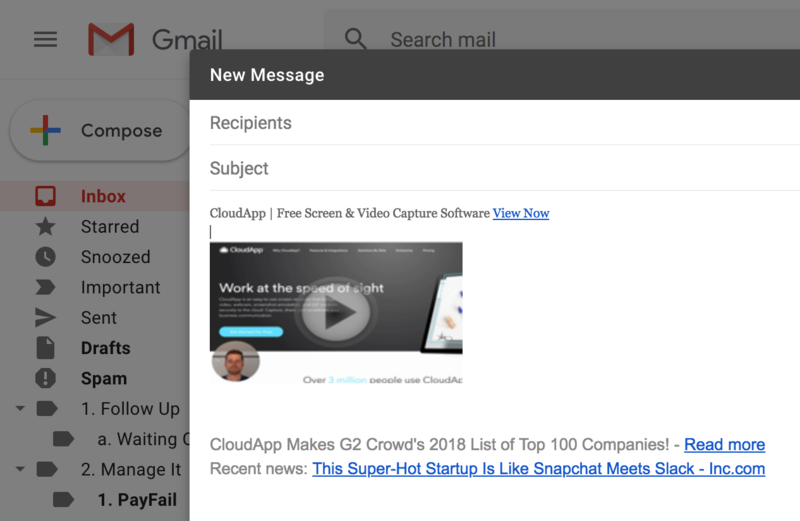 After recording a video or screenshot, simply paste your link into a Gmail compose window and you'll get a beautiful rich preview of your content with a clickable play button to drive more opens and conversations. CloudApp also has a variety of additional functionalities for your workflow and business. Control your privacy and security. Expire content, password protect it, and lock down access. Add your logo and a link to your website on your share pages. You can also customize the URL. Give your customers the full brand experience. Search within images for text, objects or attributes like color with powerful machine-learning technology. See who's viewed your content and from where. Get real time notifications when your content is viewed.